When you are planning your next party and considering adding a tropical island effect, you may want to think about constructing a tiki bar. 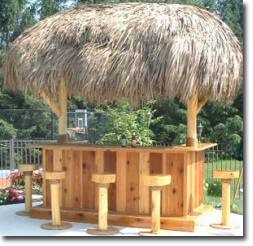 Tiki bar plans can be found on the Internet and at your local building material outlet. You can also find information at your local library about constructing these exotic hangouts. A tiki bar is relatively easy to construct, even if you are a novice builder. Of course, you can increase the size of your project from a bar to a freestanding structure in your backyard. This expanded project requires more advanced structure expertise, so we will focus on the construction of a simple bar that you can place in your den or in your basement. Tiki bars became popular in the fifties, and because of their timeless kitsch have survived as popular party accessories. If you stay true to the original theme of the tiki bar, you will only need a small amount of construction materials. To start your project, consider your design. Start small because you can always add to your project down the road. A typical design will call for bamboo, hot glue, jute rope, carpet nails and bamboo mats. You will commence your construction by lashing together bamboo into a frame using your jute rope. This is accomplished by constructing the front and back walls. You reinforce the walls with a cross member that you also bind with jute. Now you use your hot glue to fix those joints. Next you connect your front and back walls with bamboo cross pieces, and secure those joints with jute and hot glue. You can reinforce each side with a cross member configuration, again using jute and hot glue to fix the joints. Next, you spread your bamboo mats across the front and the sides, and tack them into place, using a combination of carpet tacks and hot glue. If the bar is to stand free from the wall, cover the back with the bamboo mat, using the same technique and materials. Now you cut bamboo sections that will make up your tabletop surface. You should split these pieces so that you have a flat surface to attach to the top of your bar. Next you affix these split strips to the tabletop, using hot glue. Now you have your tiki bar, and all you need to do is add the necessary tropical garnishments like palm fronds and tropical flowers. This part is purely up to you and what effect you want to create. Remember that this type of tiki bar doesn’t have the structural integrity that can handle heavy abuse like tabletop dancing. To be sure that your bar is able to withstand your party requirements, give it a few tests before you allow your friends anywhere near it. Whether you use the previous plans, find your own, or design your own, you will have a party attraction that will provide you with years of entertaining fun. If you are looking for more information on tiki bar plans, please click here. a few years ago I bought some wrought iron tiki torches at Jewel food store. the canister is removable, and they connect to the railing of the deck with a big wing nut. I’m trying to find some for a friend, but can’t find them on the internet. does anyone know where I could find something like that? I just had some made for my pool deck, heavy duty and a little costly, but they look very nice and will last a very long time.